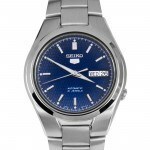 Seiko Men’s Watch SNK807K2 Review. Hello, today I’m doing a Seiko SNK807K2 review. 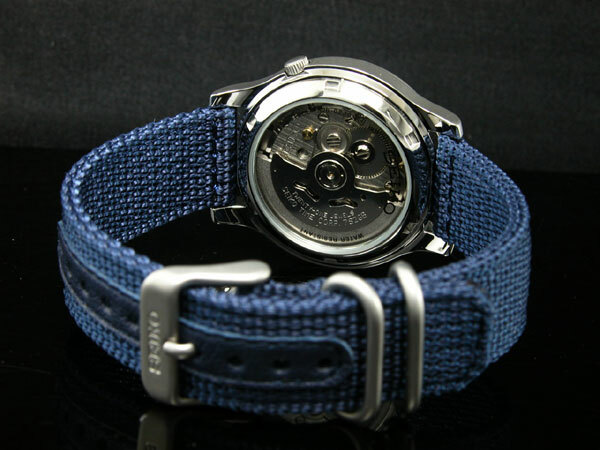 Yeah, I’m finally taking a look at another one of the most popular automatic watches from Seiko with their canvas fabric straps. It’s also found in green and black but today I’m looking at the blue edition. Anyway, I’ll get on with my SNK807K2 review below and you can find out the price on Amazon today, enjoy. In the past, I’ve taken a look at the other colour variations of this watch so I know what to expect from this timepiece. This is definitely a watch that offers fantastic value for money, after all, that’s one of the key points for the Seiko 5 series. 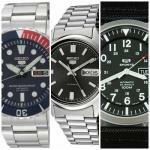 Seiko wanted to create a line of automatic watches that were accessible to everyone, and they did a very good job with the Seiko 5 series. The watches are easy to read, great value for money, and built to last. It has that typical Seiko 5 crown position tucked away behind the 4 o’clock position, and a Japanese automatic movement than can be viewed through the exhibition case back. There’s some high quality lume in use on the hands and hour markers which makes the watch easier to read in dim lit conditions as well. Overall it’s a very great watch, and we’ll take a look at each section in more detail below. The watch has a brilliant Japanese automatic movement caliber 7S26A. This is a reliable 21 jewel movement that also gives you a great level of accuracy. The movement can actually be viewed through the exhibition case back which is a really nice feature. As is typical of most automatic movements, once you stop wearing it for a day or so it will run out of power. You’ll simply need to give it a starting wind to get going and adjust the time when you next use it. As is typical of most automatic movements, once you stop wearing it for a day or so it will run out of power. You’ll simply need to give it a starting wind to get going and adjust the time when you next use it. As with a lot of the Seiko 5 range, a Hardlex glass is in use. 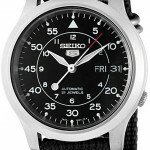 This is Seiko’s own in-house take on a mineral style glass. This type of glass is specially hardened to offer you a good level of scratch and knock resistance. It’s exactly what I’d expect to find in this price range so that’s great to see. The framing of the watch is a little smaller than the typical bigger watches you see about a lot these days. This watch has a casing diameter of 37mm which is a men’s medium, and the thickness of the case is 10mm. Overall this gives a watch a slightly smaller profile than normal, but it’s still been extremely popular. I quite like this style of date display on these watches. The day and date are both clearly display with a white background which makes them stand out from the blue of the dial, and very easy to read. As with most traditional calendars, you’ll have to adjust them for the varying amount of days in each month. Below you’ll find a great picture that really shows off the clasp and the exhibition caseback of the watch that I mentioned earlier on. The strap is made of a nylon canvas fabric which is pretty tough and very comfortable. The strap itself has a width of 17mm which is slightly smaller than average, but fits in perfectly with the casing dimensions. The clasp may not like a standard buckle, however, if you look closer at the pin holes you’ll notice the strip of rubber that makes the holes longer lasting as they are less likely to get damaged. The water resistance rating is a simple 30m, or 3ATM. 30m water resistance does still make it suitable for everyday use. Splash/rain resistant. It’s Not suitable for showering, bathing, swimming, snorkeling, water related work and fishing. As always with the Seiko 5 series, I was very pleased with what this model has achieved. It’s a brilliant watch at a very affordable price that’s within most people’s budget. I’ve always been a fan of automatic movements and love the added extra of the exhibition case back. 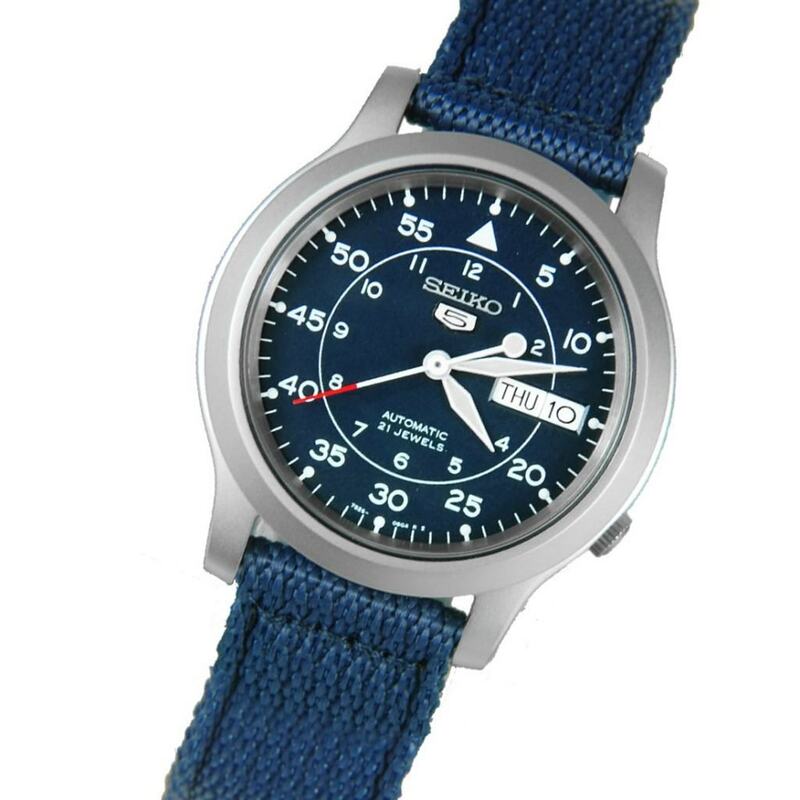 I Hope you found this Seiko SNK807K2 review useful and enjoyable, comment below and let me know what you think of it. Thanks for reading, find more of my watch reviews below. Nice, USEFUL, considered review. No extraneous “opinions” on the supposed virtues of this or that sort of glass & what ever. I wanted know: is it accurate, water resistant, tough, easy to read, value for money. You answered all that…. well done mate.